This book far exceeded my expectations for a Catholic craft book. It arrived on a rainy afternoon, and so the kids and I decided to dive right in. 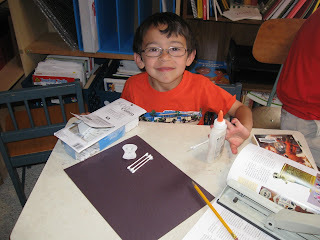 Since we homeschool, we already had many of the neccessary materials in our schoolroom. There is an index that makes it easy to choose a project based on the ages, interest, or abilities of your children. Full color glossy pictures also help guide the selection process. The suthor also included a craft glossary to help define many uncommon terms used throughout the book. What makes the book specifically Catholic are not the crafts alone (although there are plenty of included activities that use Catholic images). Ann Ball includes a short teaching with each craft to combine faith teaching and art. The crafts can be done without the teaching when not all the children present are Catholics. 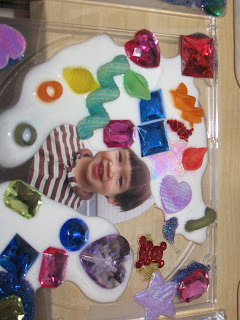 Many of the crafts are easily modified to fit the needs of your children. 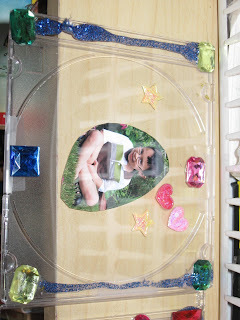 For example, the first activity my children did was the CD holder frame. The craft is intended for a photo of a new baby, but I let each of my children complete the craft with a photo of themselves. Please excuse the direction of some of the photos, I don't know why blogspot insists on turning them. Ann Ball encourages the parent to let go of their expectations of the finished product. For the child, the process is much more important than the product. I have no problem doing that with almost everything. The less involved I have to be, the better! 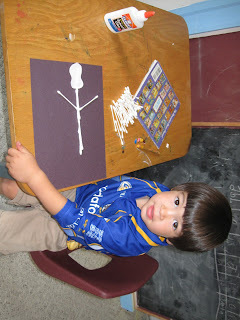 The next craft we completed was Calaveras. 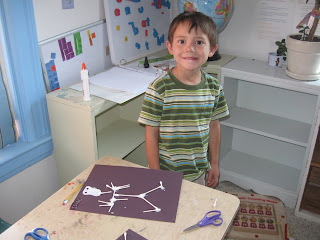 This craft is intended to be completed on the Day of the Dead, but my boys adore skeletons (and everything else spooky) and we had all the supplies so we decided to give it a shot. They really had a great time making spooky skeletons. This is definitely a craft we will repeat! 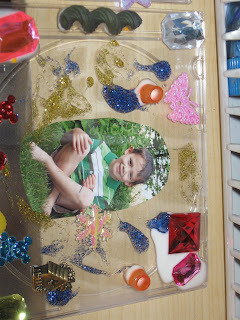 Many of the crafts seems geared towards older elementary student, but as I stated above, they are easily modified to fit the abilities of almost any child. And given the attractive, user-friendly layout of the book, I would say it is a must-have for every Catholic family with kids! This reivew was written as part of The Catholic Book reviewer program for The Catholic Company. Click here to find more out about Crafty Catholic Kids.